Wales face Australia in Cardiff on Saturday. FULL-BACK LEIGH Halfpenny will start his first international Test in 14 months when Wales take on Australia on Saturday. The goal-kicking Toulon back will line up at 15, Scarlets rival Liam Williams missing out on selection through injury. In the absence of captain Sam Warburton, loose-head prop Gethin Jenkins will skipper an experienced side despite Taulupe Faletau (injured) and lock Alun Wyn Jones (family bereavement) also sitting out the game at Cardiff’s Principality Stadium. It will be the seventh time that Jenkins, Wales’ most capped player of all time, will lead his country, with Wales going on to play Japan, Argentina and South Africa in their November Test schedule. The experienced starting XV can boast 802 caps between them but there are two uncapped players named amongst the replacements in Ospreys fly-half Sam Davies and Newport Gwent Dragons lock Cory Hill. Captain Jenkins will pack down alongside Scarlets pair Ken Owens and Samson Lee in the front-row, with Bradley Davies and Luke Charteris linking up in the second row. Ross Moriarty packs down at No 8 and is joined in the back-row back Ospreys duo Dan Lydiate and Justin Tipuric. Ospreys half-backs Rhys Webb and Dan Biggar start their sixth successive international alongside each other, with five Lions named in the outside backs: Jamie Roberts partners Jonathan Davies in midfields, while Halfpenny makes his first appearance for Wales since September 2015 alongside George North and Alex Cuthbert. “It’s great to welcome back Leigh Halfpenny, Dan Lydiate and Alex Cuthbert who missed the New Zealand tour plus George North and Gethin Jenkins who left the tour early with injury,” said Wales coach Rob Howley, in charge following Warren Gatland’s secondment to the Lions. On the bench, Scott Baldwin, Nicky Smith and Tomas Francis make up the front-row replacements with uncapped Hill and James King completing the forward contingent. Gareth Davies, Sam Davies and Hallam Amos provide the backline cover. Replacements: Scott Baldwin, Nicky Smith, Tomas Francis, Cory Hill, James King, Gareth Davies, Sam Davies, Hallam Amos. 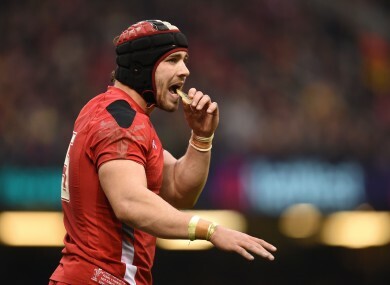 Email “Wales boosted by Halfpenny return for first Test appearance in 14 months ”. Feedback on “Wales boosted by Halfpenny return for first Test appearance in 14 months ”.